My second visit to the institution I had already known beforehand that someone had torched certain sections of the children's ward. I saw all the fire damage in person to my dismay. I would never understand why someone would either torch a place for no reason at all or play around with fire inside old buildings to create that "shot". However, nefarious the reason I came back with my good friend A.
I found my way inside the famous bowling alley so many others have come to see. I also gained access to the main auditorium which was completely spotless from any graffiti or mounds of garbage. On the other hand, things became a lot worst inside the small auditorium inside the children's ward if you look back at my visit in 2016. It was inside here that we met other explorers taking in the ward. My friend A collaborated expeditiously into a portrait session and we were on our way less we get caught with the newcomers. Local police are known to patrol the campus frequently. 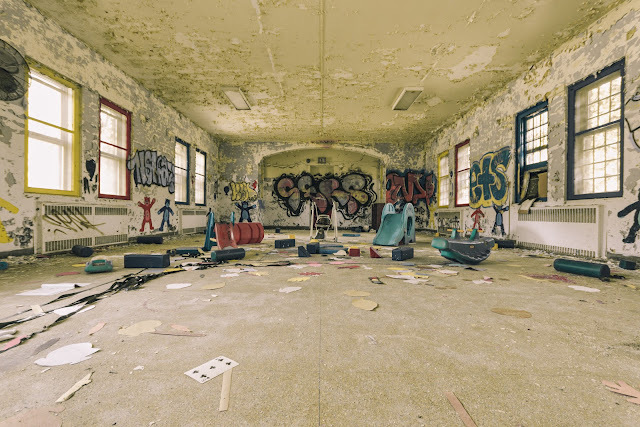 This once 600-acre mental asylum once housed 11,000 patients within its lush acreage and winding paths. 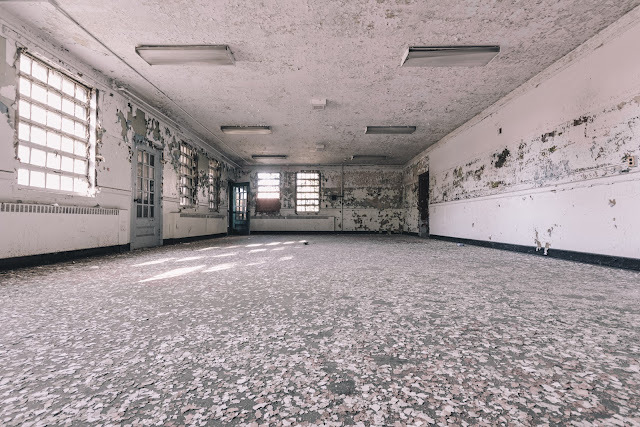 A psychiatric hospital that once considered lobotomies and electroshock therapy as a first-rate treatment for the mentally ill. Now, part of the vast semi-abandoned buildings has found the wrecking ball for a different type of electroshock therapy. About 60 acres of land will become a banking data center built by the financial Wall Street juggernaut, JPMorgan Chase. A 150,000 sq ft data center will sit on the grounds where patients actually made the hospitals furniture and ran some of its facilities such as the power plant, farm and shops. As of now that facility has been built paved by the way of $40 million dollars in demolition and cleanup costs. I was gobsmacked when I saw this piece in a nondescript back room. A true work of art. 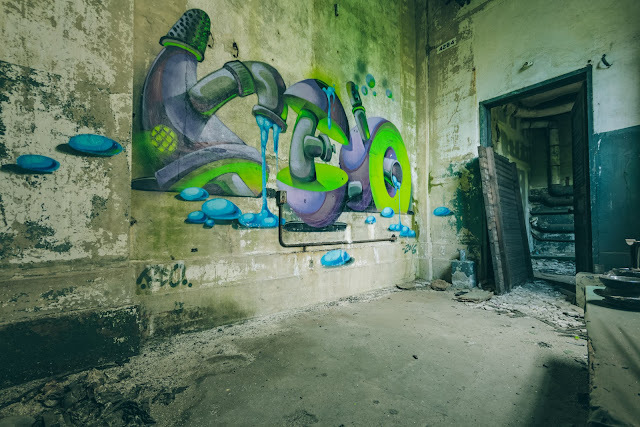 It was the only graffiti I saw whilst exploring this place. This place had a lot of piping and it was only fitting the artist responded in kind.